Taste test: These tortilla chips were slightly larger than Doritos, and they tasted pretty good at first, but probably not as good as regular Doritos. The taste improved considerably when the slightly hot aftertaste kicked in, and that was quite good. Unforunately, the chips were not as crisp as they should have been, just slightly stale, even though they were eaten two and a half months prior to their expiration date. 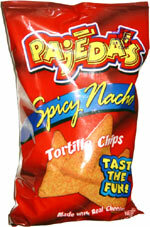 Smell test: Good toasted tortilla chip smell, not really cheesy.